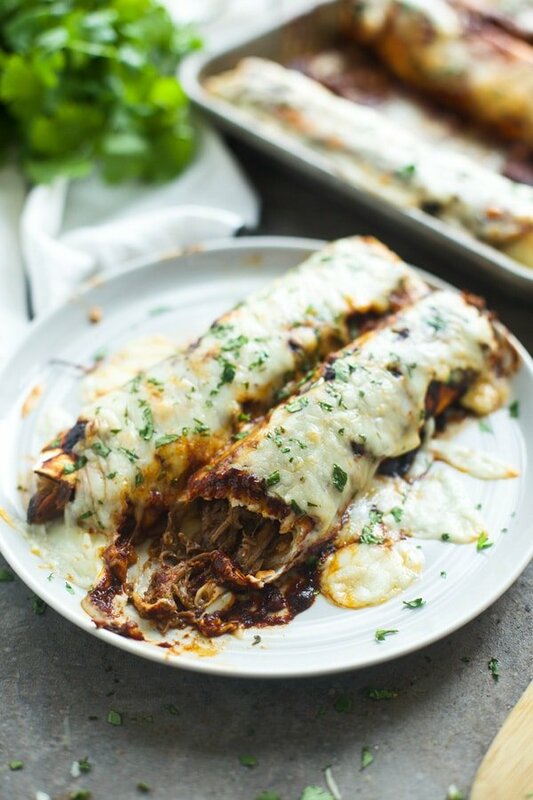 These Shredded Beef Enchiladas with Ancho Chile Sauce are a labor of love, but they’re worth it, trust me. Don’t walk, RUN to the store to get the ingredients. I feel like I’ve finally been conquering life lately. My anxiety has taken a slight backseat, my child is the sweetest, cutest little troublemaker, and I actually feel like I can manage staying at home with him while simultaneously running this blog full-time. I’ve been cranking out new recipes like this Tomato Butter Roasted Salmon (that has already received rave reviews from you guys) and this Ridiculously Cheesy Onion and Artichoke Dip like it’s my job (oh wait it IS my job), and am back to posting three days a week, which is a victory in and of itself. I was feeling pretty darn good about myself come Sunday afternoon when the house was clean, my son was in the midst of a three-hour nap, and I had three game day apps just waiting to be devoured by hungry football watchers, when I realized, I didn’t have a post ready to go live Monday. 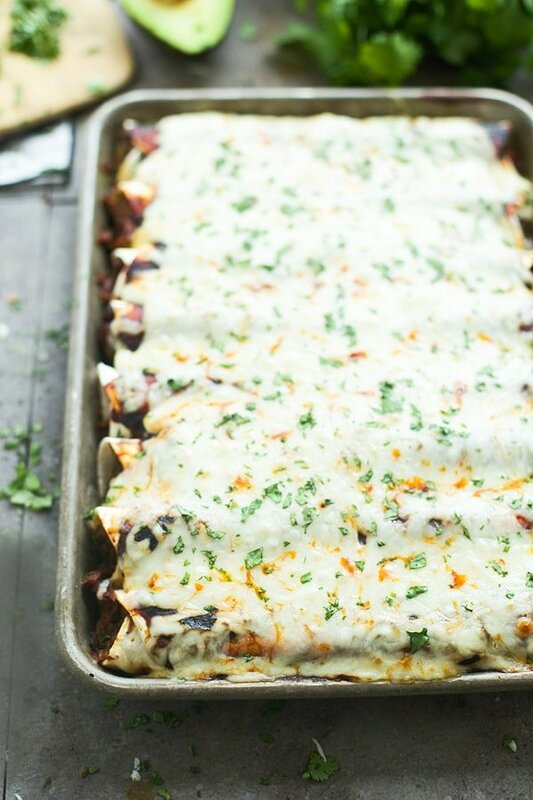 Plus, these enchiladas weren’t meant to be haphazardly whipped up in a hasty, chaotic manner. 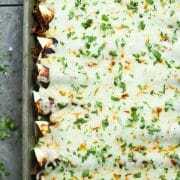 Because these enchiladas, they’re a labor of love. Everything from the ridiculously delicious slow-cooked beef to the ancho chile enchilada sauce is made from scratch, and requires a bit of time and patience to reach the dinner table, but I promise, it’s worth it. 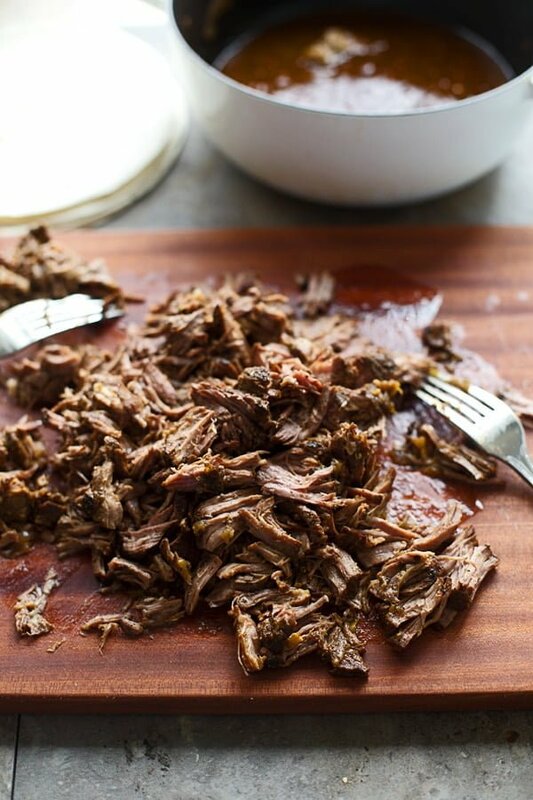 As the name implies, the star of the show is the shredded beef, which is melt-in-your-mouth tender, and PACKED with flavor, and honestly, could be used in just about any Mexican or tex-mex dish – tacos, burritos, quesadillas, flautas, whatever. I start with a chuck roast (about 2 pounds), season it liberally with salt, pepper, and cumin, and then sear it in a screaming hot dutch oven. Once it gets a nice crust, it gets slow-cooked with a little bit of tomato paste, beef stock, cumin, green chiles, plain chili powder and chipotle chili powder until you can shred it with a fork – about 3 ½ hours or so. I know, it’s kind of a long time, but your really need that long for the tough meat to break down, plus it’s all hands-off, and can be made ahead of time (I did it the night before), so that helps. The enchilada sauce is a slight derivative of my classic enchilada sauce, but instead of only using chili powder as the dominant flavor, I added in dried ancho chiles and super spicy chipotle powder. Working with dried chiles may seem a little bit intimating, but they are super easy to work with, just toast them, take out all the stems and seeds and in this case, throw them in to the pot with the base of the enchilada sauce. Also, if you’re not familiar, an ancho chile is basically just a dried ripened poblano pepper, so it has a very mild spice to it – just enough in my opinion. It’s also kind of sweet and a bit smoky, which I happen to think works perfectly with beef. Everything else comes together pretty effortlessly. 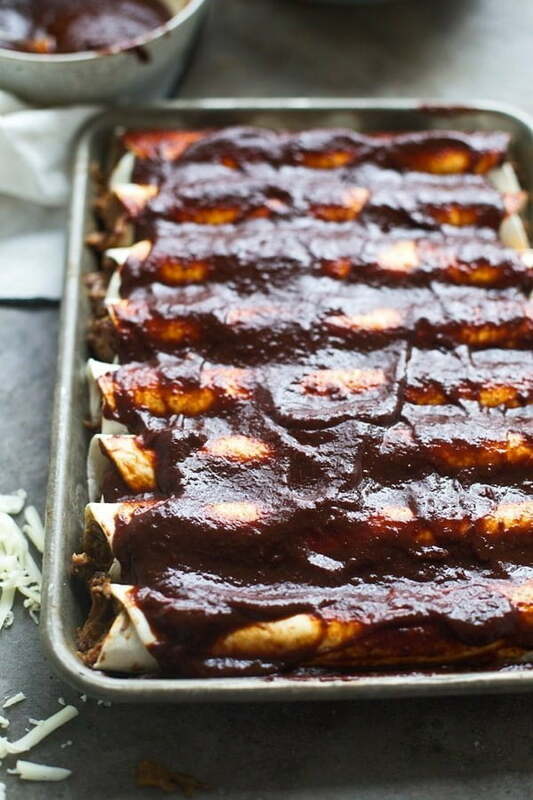 The beef gets rolled up in tortillas, they’re all nestled into a sheet pan, covered in enchilada sauce, covered in cheese and then baked until the cheese has melted into a gooey oblivion. I serve them with chopped cilantro and that’s it. Simple and delicious. Preheat oven to 350 degrees. Grease a 9x13 casserole dish. Pat beef dry. Season liberally with salt and pepper. Evenly sprinkle 1/2 tsp. cumin and onion powder on beef. Heat a medium dutch oven to a high heat. Add oil. Sear beef on all sides until crusty and brown, it should take about 10-12 minutes. Once all the meat is seared, remove from pan. Reduce the heat to medium and add onions and garlic. Sauté until slightly softened, about 2-3 minutes. Add tomato paste. Stir, cook for one minute. Add beef stock, remaining cumin, vinegar, chipotle pepper powder, chili powder, green chiles, and salt. Stir to combine. Add beef back to the pot, bring to a boil and then reduce to a low simmer. Cover and cook of 3 1/2-4 hours or until fork tender. Once beef is tender, use a fork to shred the beef. Add the beef back to the liquid. Set aside. Spoon some enchilada sauce in the bottom of the prepared pan. Evenly divide the beef between 8 flour tortillas. Tightly roll up each tortilla and place seam-side down in pan. Cover in enchilada sauce, use as much or as little as you want (I did not use all mine). Cover in shredded cheese and baked just until the cheese is melted, about 15 minutes. Serve with chopped cilantro. Preheat oven to 350 degrees. Place dried chiles on a baking sheet. Toast in the oven for 2-3 minutes or until they smell fragrant, DO NOT LET BURN! Remove stems and seeds and tear in to small pieces. Set aside. For the sauce: Heat a medium sauce pan to a medium heat. Add oil. Add onion and garlic. Saute for 1-2 minutes or until slightly softened. Add tomato paste. Stir to combine, and cook for 1 minute. Whisk in chicken stock, chili powder, chipotle powder, vinegar, cumin, salt and sugar. Once the mixture is smooth, add in chile peppers. Bring to a boil and reduce to a simmer. Cook for 15 minutes. Once the sauce has simmered for 15 minutes, transfer to a blender along with a 1/4 cup of water, blend until smooth.If needed, add more water to get to desired consistency. Season to taste with salt and pepper. I separated the recipe for the sauce and beef for simplicity, a lot of the ingredients are in both. You will only need one 6 oz. can of tomato paste. 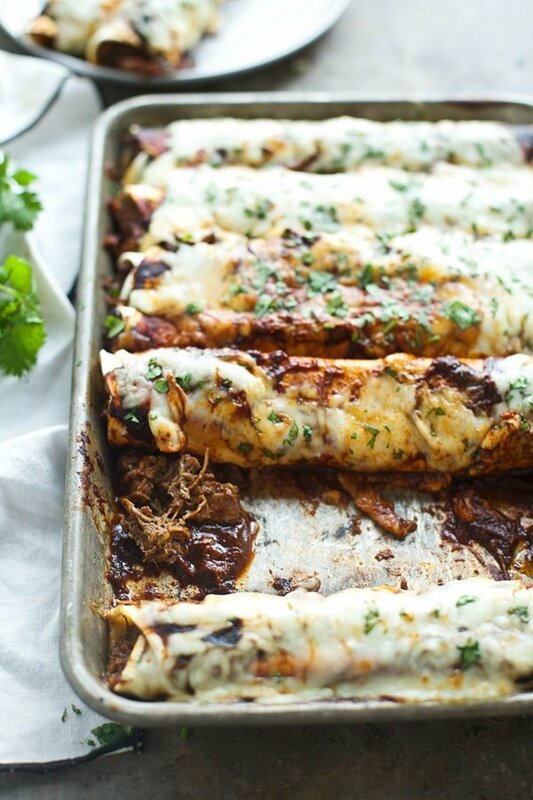 14 Responses to "Shredded Beef Enchiladas with Ancho Chile Sauce"
Oh my goodness this looks AMAZING. I’m a huge mole fan, and this seems right along those lines. Love it! Love your post. I am a big fan of Mexican too and love to make authentic sauces. One of my favorite sources is actually Rick Bayless’ cookbook. I like that you have simplified making the sauce a bit. A lot of enchilada sauces actually call for first mixing and blending the ingredients, then frying the actual sauce and then letting it simmer. It does bring out the flavor quite a bit. Thanks for the recipe! Hi Jeff! Thank you so much for the comment! I LOVE Rick Bayless, he’s definitely the king of Mexican food! I made these yesterday and had some friends over to try them. I just want to say that they were the best enchiladas any of us have ever eaten! The ancho sauce had a wonderful smokey flavor with just the right amount of heat and the chuck roast had my kitchen smelling amazing all day as it cooked. Thanks for the great recipe, I’ll definitely be making them again. So glad you loved them! 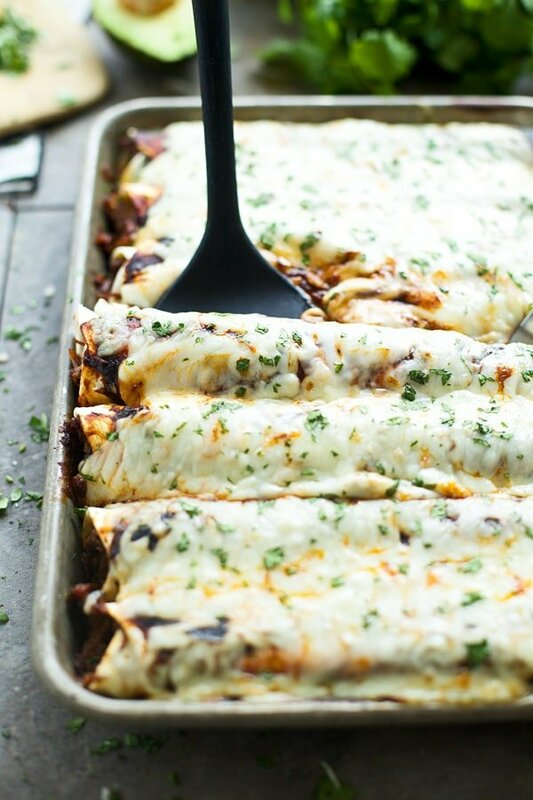 These are some of my favorite enchiladas ever! For the Ancho Chile sauce – in the directions it says dried chile but just says Ancho chile in the list of ingredients. Do they need to be dried or fresh. I just don’t want to mess up the recipe. It sounds yummy. My mouth is watering looking at these! Can we make the beef in the Crock-Pot? Definitely! I would still sear it before, but that should work fine! Thank you! Can’t wait to try!